What do Stanley Morison, the Fell types, egg sandwiches and literary hoaxes have in common? You’ll find out in Stanley Morison’s Egg-Sandwich Exegesis, a parody of the twentieth century’s greatest typographic historian. As you can guess from this description, the book was published for a very . . . select audience. In a fit of optimism, we printed 100 copies. For anyone who enjoys a good literary hoax and a bit of fun at a great writer’s expense, this book is sure to delight. 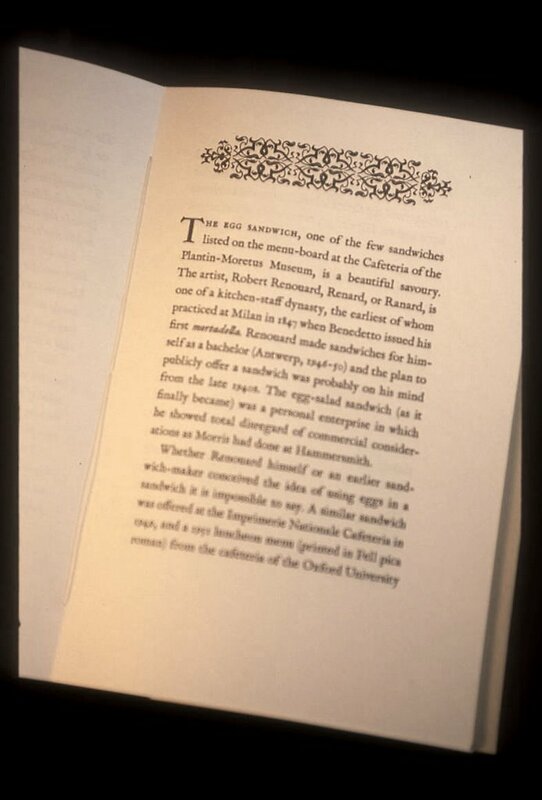 Stanley Morison’s Egg-Sandwich Exegesis is set digitally in Fell types—about which Morison spent forty years researching and writing—and was printed letterpress on Mohawk paper and bound in soft covers. With an original illustration by Brent Dutton. Nine pages. 5 by 8 inches. The price is CDN$30 which includes shipping anywhere in the world. Books may be ordered directly from the Press by email or by calling 604 731 6365. We accept payment from bank-account funded PayPal accounts, international money orders or (in Canada) personal cheques. Please see our blog for more information. This entry was posted on Monday, April 3rd, 2006 at 7:16 pm	and is filed under Inferno Press. You can follow any responses to this entry through the RSS 2.0 feed. You can leave a response, or trackback from your own site.